It can be a jungle out there. KGUN9's Cody Schiever shows how weeds are exploding in Southern Arizona following winter rains and what treatment options are available. TUCSON, Ariz. — It can be a jungle out there. People's yards across southern Arizona are experiencing a weed explosion. 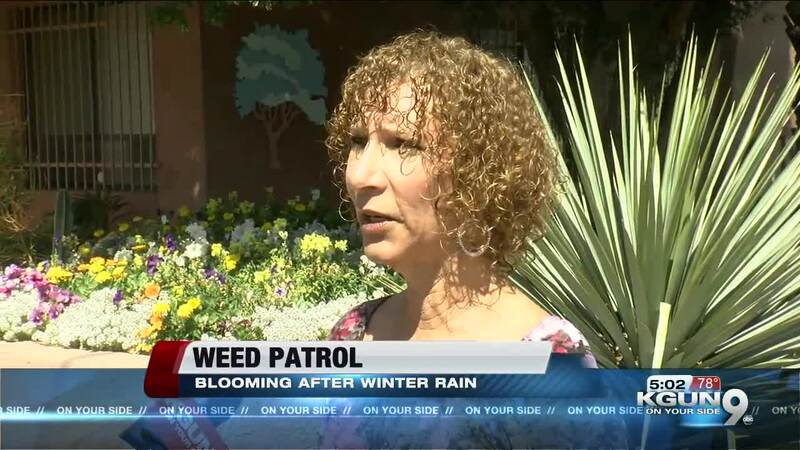 Dawn Fried, Vice President of landscaping company Horticulture Unlimited Inc. says the pesky plants are fueled by winter rain, a problem since weeds will only continue to thrive in the Tucson heat. "When you are manually removing weeds you don't always get the root system or the full weed, you're not really taking care of the problem," said Fried. For the past 40 years, Fried has been telling her customers to spray pre and post herbicides on the plants, but it's all about timing to prevent weeds from ruling your yard. "If it's sprayed on a very calm day with no wind and in the morning it is truly the best time," Fried explained. "70 degree temperatures or higher is the best to be very effective." In other areas in Tucson, some have another way to dispose of the undesirable plant.The Garden District of Midtown hired a company called Urban Grazers to bring in living lawnmowers. For the goats, weeds are not a nasty nuisance, they're a tasty treat. For those of you without goats in your backyard, weeds can trigger allergies. One local allergist says this years increase is due to high carbon dioxide in the air. "Pollen allergies make people have headaches, congestion and miss work,": said M.D. Allergist George Mikol. "It can go on to a sinus infections and asthma, that's the point where a specialist can really be helpful."